The centenary of the First World War is approaching. Do you see any similarities between 1913-14 and now? There are some similarities because both then and now some of the major powers seem to be either slowly responding or misunderstanding the situation, or failing to see the risks in it. But beyond these similarities I think there are also very important differences, namely that 1914 did lead ultimately to world war. I don't think at this stage anything like that is inherent in the otherwise complicated situation that we confront. There could be, in the worstcase scenario, a serious explosion in the Middle East region, and defined more grandly geographically. It could spread eastwards into Afghanistan and eventually affect Central Asia. It could spread northwards to Iraq, towards the Mediterranean and even the Russian Caucasus and so forth. But I don't see a war in any way that is reminiscent of the First World War. A serious explosion -- more intense than we're seeing in Syria at the moment? Well, yes. That is to say the conflict spreading, infecting Jordan, Lebanon and Iraq more dramatically still and then beyond. You said the major powers were slow to react then and now. Has the US forgotten the need for proactive international engagement? That depends on what our friends mean when they say 'proactive international engagement'. Being involved in trying to negotiate the Israeli-Palestinian peace process, taking the initiative and negotiating with Iran, possibly being involved more actively in trying to find some sort of negotiated solution to the Syrian problem -- to me that adds up to a very proactive involvement. Now for some, that's not enough. Some would like us simply to go to war in Syria. Unfortunately, some would like to see us attack Iran, either on our own or in the wake of an Israeli attack. I tend to draw the line between these two sets of alternatives. The former I support. The latter I regard with scepticism and suspicion. Talking of Syria, from the beginning the White House was saying Assad must go. Does that amount to a policy? I found that baffling because I was sufficiently well-informed to conclude that there wasn't much behind those words. There was an expectation that he would fall and therefore it appeared insightful -- anticipatory perhaps -- to say that he should. But that was not the case. It has made the situation more problematical. So there's been a sort of drift for the past two years? Yes. There was a tendency initially to use language derived from the earlier phases of the so-called Arab Spring, regarding the quest for democracy on the part of the parties involved in the incipient violence. In this particular case, I was very much conscious of the fact -- and I would have thought others should have been also -- that we're not dealing with a democratic upheaval, but with the propagation of a sectarian conflict. Since the end of the Cold War, America has been the world's hegemon. Has that period ended? I have written that we're now living in a post-hegemonic era. In my use of the word 'hegemon', I applied it literally. That is to say it is a country that can directly dictate to other countries and almost without any effective opposition. Well, obviously we're not in that position. It is a fact that probably for the past 200 years the major wars that originated in Europe had as their objective -- or could have ended creating -- a global hegemony. Certainly illusions to that effect in different degrees were entertained by Hitler and Stalin. I don't think we're in that era anymore, but some states are obviously much more powerful and therefore influential, even if not necessarily hegemonic. So I am not talking about some global equality or global turmoil based on semi-equality. The world is still very much stratified when it comes to influence. And America is still at the top of that stratification? Precisely. And it's going to be there for quite a while yet. Excuse me, where is that success? The Western powers thought the opposition would have a clear run at deposing Assad and the UN would support it, but the Russians have stopped that with their veto. The problem with that, of course, was that the Western powers wanted us [Americans] to do that on our own. It wasn't any kind of collegial effort, but simply egging us on to do something that, in my judgment, could have become quite a disaster. It had the potential to set off a regional explosion, the kind that we have just talked about. So I have a rather different view on the 'Russian success'. I think the Russians unintentionally did us a favour, even though they get some benefit from it. But that benefit is limited by their realization that this is not a zero-sum game anymore. They want to preserve their residual assets in Turkey and in Iran in terms of relationships, but these are not going to be hegemonic or exclusive. They help us also to partake of some influence in the region and they are even more concerned perhaps than I am about the consequences for themselves of a regional explosion. So the Russians are going to have to take more responsibility for what's going on? Precisely. I think that's a good thing and I would like to see the Chinese more involved, as well. Well, it's beginning to happen in the case of Iran. They're beginning to be more active and I would like to see them even more active and I should think they ought to take an interest in what happens elsewhere in the Middle East. In terms of tangibles, that's likely to have more direct consequences for them than for us. Because they depend heavily on Middle Eastern oil. How do you see the chances of a nuclear deal that salvages Iranian honour and meets the needs of non-proliferation? I think the chances are there. There's always a risk of some sort of backfire reaction both in Iran or Washington or from some of our friendly partners in this undertaking. So there is a risk that we'll miss an opportunity that was within reach. Having said that, I still retain some degree of optimism provided the American domestic scene doesn't immobilize the President and prevent him from giving the kind of support his Secretary of State deserves. To be frank, this is more or less an American- Iranian negotiation. If it fails, it's going to be an American-Iranian showdown. Congress seems in the mood to block whatever the President wants to do. Is that simplistic? No, that's unfortunately correct. They are doing it because part of the opposition is motivated by an anti-Obama passion that verges on the irrational. Part of the opposition is more sympathetic to the foreign policies of another country than with America itself. That is unfortunately a painful reality and one which weakens America's ability to negotiate seriously. You must be referring to Israel. What advice would you give to Benjamin Netanyahu? Well, I am certain he would not be minded to take my advice, because his worldview is very different from mine. He is thinking rather opportunistically in terms of his immediate political prospects and very one-sidedly in terms of Israeli interests. If one looks at the longer range calmly, it's simply incomprehensible to me that someone might prefer to have no agreements in the area pertaining either to Iran or to the Israeli-Palestinian process than to have some compromise agreements which help to stabilize the situation and resolve the longer-range dangers that are on the horizon in the absence of an agreement. What leverage can be brought to bear on him to accept the rationale of compromise? A clear indication that the United States knows what it wants and will stand by it. Most Israeli public opinion would support a compromise and the overwhelming majority certainly would not want to place the American connection in jeopardy. If it became clear to them that it is their Prime Minister who is placing them in jeopardy, I think his ability to influence events would be drastically altered. So what matters to the Israeli public is preserving that lifeline to America? Israelis are on the whole a very intelligent and alert people and if they begin to assess the situation, in part at least, from the American vantage point, they ought to conclude that a healthy American-Israel relationship cannot be based simply on a one-sided acceptance of the most ambitious territorial or national objectives of Israel as defined by its Prime Minister. If the current peace negotiations fail, could the Israeli Government decide to annex a majority of the West Bank and have done with the two-state solution? That is the question. How can you annex a land without annexing the people? Are they going to incorporate the Palestinians as second-class citizens? That's what Ehud Barak called apartheid. Are you going to evict them or are you going to turn them into second-class citizens? It would be possible to annex most of Area C, including the Jordan Valley, and leave the Palestinian population centres as leopard spots. Well, what do you do with the people in them when they begin to realize that a lot of that land has been confiscated from them? Remember what led to the Intifada, and Sharon's suppression of it. That's a prospect which any individual who loves Israel and wants to see it prosper can't accept as desirable. A lot of Israelis realize that if Israel and Palestine were to settle their problems, that combination could become the Singapore of the Middle East. It would benefit both peoples. The direction in which the current Prime Minister would want to lead them points to the rather grim prospect that I've outlined to you a few seconds ago. China's President Xi has talked about a 'Silk Road economic belt' bringing prosperity to Central Asia. Is this a positive development? I welcome it. I think it's going to have another very important effect. It's going to make the Russian people recognize that the only future for Russia is to become part of Europe, and the only way that Russia can ever become part of Europe is if it becomes a democracy. That's the real geostrategic significance of what the Chinese are doing -- maybe not intentionally, but the effect will be beneficial to all concerned. You mean the Russians giving up their imperial nostalgia of controlling Central Asia? Well, they wouldn't give it up. They would lose it. Is China Copying the Old Imperial Japan? NATO, Russia and Ukraine: Roulette or Reset? What do the Putins of the World Want? Turkey & Armenia: Are Erdogan's Condolences a Turning Point? Russian Bases in the Americas: A Bluff? Bachelet's Chile Moving Closer to Venezuela? Should U.S. Cut Venezuelan Oil Imports? Is Al Qaeda Waxing or Waning? Will Israel 'Bounce the Rubble' in Gaza? Reviving the North Korea-Iran Axis? Why Are Governments Not Looking After Themselves? Egypt: The First Nation Ever to Revolt Against Democracy? Supreme Court Rules on Public Prayer -- But Should It? Can Ethnic Hate Be a Mental Illness? Article: Copyright © 2014, Tribune Content Agency. 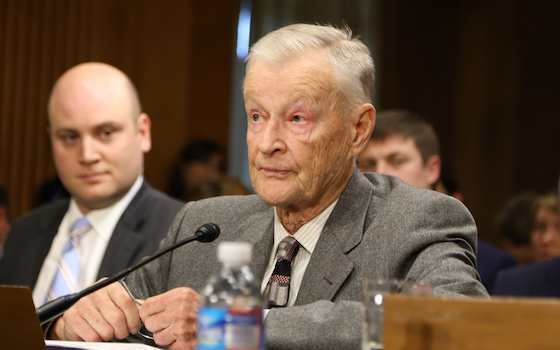 "Zbigniew Brzezinski on How to Avoid a New Middle East Explosion"